Do you want to learn to use data analytics to make forecasts in business and drive better decisions at your firm? This certificate program reviews and teaches best practices in using data analytics and predictive modeling to understand business behavior and forecast future 'variables of interest'. 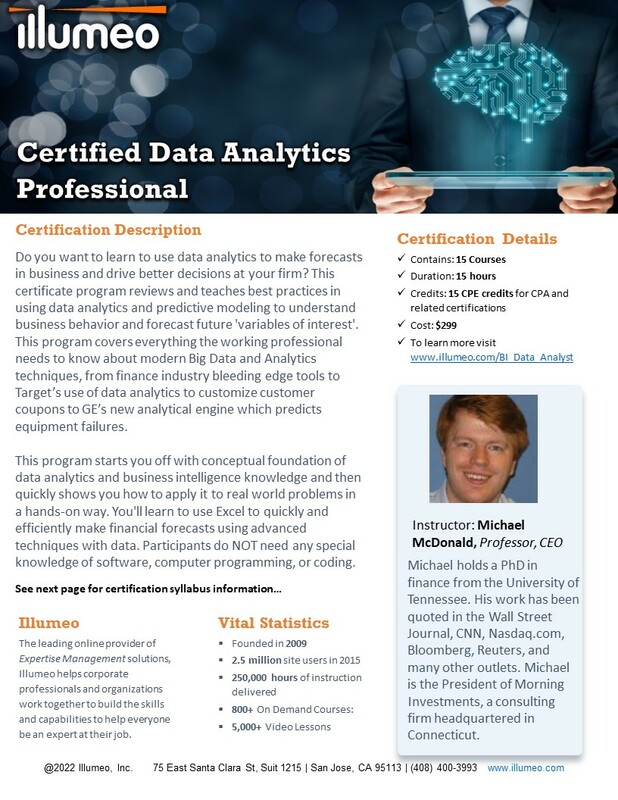 This program covers everything the working professional needs to know about modern Big Data and Analytics techniques, from finance industry bleeding edge tools to Target’s use of data analytics to customize customer coupons to GE’s new analytical engine which predicts equipment failures. This program starts you off with conceptual foundation of data analytics and business intelligence knowledge and then quickly shows you how to apply it to real world problems in a hands-on way. You'll learn to use Excel to quickly and efficiently make financial forecasts using advanced techniques with data. Participants do NOT need any special knowledge of software, computer programming, or coding. All of the application of the material in the course is done using Excel so that participants get comfortable with the material. Once the participant is comfortable with the foundations of Big Data and analytics, the course moves on to more advanced forms of data analytics including using data for making predictions and business forecasts. Michael holds a PhD in finance from the University of Tennessee and his work has been quoted in the Wall Street Journal, CNN, Nasdaq.com, Bloomberg, Reuters, and many other outlets. Michael is the President of Morning Investments, a consulting firm headquartered in Connecticut. He consults extensively with organizations ranging from Fortune 500 companies and government agencies to start-up businesses on matters related to finance and investments. Michael has served also as an expert witness on finance related matters in legal disputes, and is an arbitrator with the Financial Industry National Regulatory Authority (FINRA). He is also an assistant professor of finance at Fairfield University in Connecticut. This course explains why business intelligence (BI) is an important new tool for modern business. This course explores the most common tools and uses for business intelligence across a variety of industries. In this course you learn how to begin business intelligence projects by collecting and building data sets relevant to your firm. This course covers cleaning databases and structuring them in a way that maximizes accuracy of business intelligence. This course prepares participants to review, analyze, and make decisions based on results from business intelligence projects. This hands-on course walks participants through starting a real world data analytics project in Excel. This course is the second hands-on module giving participants experience in building a dataset and running statistical analysis using regressions. This course prepares participants to make more accurate financial forecasts in standard GAAP format financial statements using forecasting techniques. This course is focused on dealing with omitted variables problems that can result in inaccurate forecasts when using financial data. This course explores how to use advanced statistical tools like Fixed Effects Regressions and Difference-In-Differences. This course is a case study hands-on module giving participants experience in using unstructured data to do analysis through Excel. This course explains how to create a more accurate forecast from statistical results like regressions, and how to evaluate that forecast. This hands-on course takes the theory from the course, "Using Regressions for Forecasting", and puts it into practice. This course examines the fundamentals of Blockchain as it relates to business.